Trade Shows have been going on for centuries, and companies are still investing time and valuable resources into creating a successful marketing campaign for the trade shows they plan to exhibit at. Displaying signage around your booth is an essential way to engage with your audience and using digital signs can create an even more attention-grabbing booth. Your signage will be the first thing someone notices at the show, and that’s why it’s crucial to determine the placement. It could be placed on a stand on the floor, mounted and displayed on a wall, or even be suspended in the air. 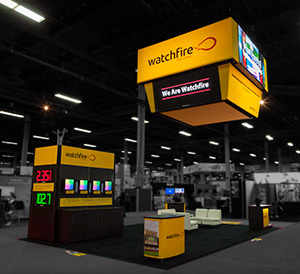 The goal is to be one of the most eye-catching exhibitors, and the placement of your digital signage is key. Attendees want to know what your company is all about and see what you’re offering, and digital signage is the easiest way to broadcast it. Now when someone walks into your booth you can engage with them about an offer running on your digital signs or explain to them what makes your company unique without starting from ground zero. It’s the ultimate icebreaker! If you have special events or product demonstrations be sure to promote that on your signs. Digital signage will catch the attention of attendees and including a call to action is important. For example, you could say “Stop by for a software demonstration at 1 p.m.”, “Come talk to us”, or “Ask us about our latest product release.” These are just a few examples of the endless calls to action that can be displayed on your signs. Also, it’s recommended that you do not incorporate a need for sound with your digital signage. You don’t want to rely on audio during a show when the floor is already loud enough, and the sound might end up be washed out. Content for each show needs to be customized. It’s easy to want to re-use all the content you already created for another trade show, but the audience and show is always a bit unique. You could always re-use some pieces, and then build new pieces that cater specifically to that show. This will truly catch people’s attention and it will also help to create conversation in your booth with the attendee’s interests at hand. Having digital signage in your booth will ultimately enhance your brands appearance and allow you to engage with your attendees before they even step into your booth. We encourage you to check out our booth this year at ISA Sign Expo 2018 in Orlando, FL. Get your free passes at watchfiresigns.com/isa.